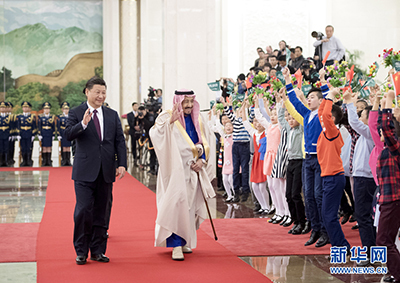 BEIJING, March 16 (Xinhua) -- Chinese President Xi Jinping and visiting Saudi Arabian King Salman bin Abdulaziz Al Saud have agreed the two countries will step up cooperation in all areas and push forward their all-round strategic partnership. In their talks Thursday in Beijing, Xi recalled his visit to Saudi Arabia last year, during which he reached consensus with King Salman in advancing bilateral ties and cementing cooperation in international and regional affairs. Xi said he was happy to see that consensus had been implemented by both sides. China supports Saudi Arabia as it advances on a development path suitable to its national conditions, maintains national sovereignty, security and development interests, and plays greater role in regional and global affairs, Xi said. China supports Saudi Arabia in its "Saudi Vision 2030" plan, and welcomes the country to be a partner in the Belt and Road Initiative, Xi said. 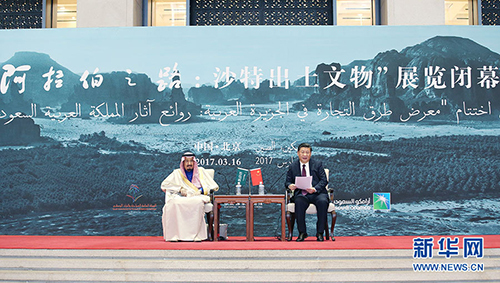 China is a reliable and stable market for Saudi Arabia's oil, Xi said, calling for closer cooperation in such areas as energy, communication, aviation, finance and investment, culture, education, public health, technology, tourism, media and security. Xi said China and Muslim countries respect each other and set an example of harmonious coexistence between civilizations. In Middle East affairs, China advocates respecting national sovereignty and non-interference in internal affairs, Xi said. China advocates solving disputes through dialogue, easing tensions on hot issues, giving full play to the United Nations' key role and paying more heed to the voice of regional organizations and countries, he added. The solution to many issues in the Middle East lies in development, Xi said. China hopes to boost the Belt and Road Initiative with countries along the route including Middle Eastern countries, he added. King Salman voiced adherence to the one-China policy, and vowed to cement cooperation with China in the areas of trade, investment, finance and energy, in order to upgrade their all-round strategic partnership. Saudi Arabia highly values China's stance of non-interference in other countries' internal affairs, and solving disputes through dialogue and peaceful means, he said. King Salman also appreciated China's role in maintaining international peace and security, expressing his hope for China's greater role in Middle Eastern affairs. After their talks, the two heads of states witnessed the signing of cooperative agreements on trade, economy, energy, capacity, culture, education and technology. They also attended the closing ceremony of an exhibition of archeological relics from Saudi Arabia. King Salman is on a state visit to China from March 15-18 at Xi's invitation. It is his first China visit since becoming king of Saudi Arabia in 2015.